Dominic is the second of my three children. Our journey with Dominic started with the routine ultrasounds and blood work that most pregnant women go through, but the results of these early tests were stressful. At my 12-week screening, Dominic’s limbs measured shorter then anticipated for his gestational age and this started the emotional roller coaster of check-ups, additional blood work, specialist appointments and even more ultrasounds. Testing continued until week 32 when our amniocentesis results came back negative for Down syndrome, but with a definitive diagnosis of dwarfism. So once again we planned and prepared for our baby, only this time, one with a smaller stature. On a warm day in early August, we celebrated the birth of our second son, fell instantly in love with him and couldn’t wait for his big brother to finally meet him. He was perfect in every way and completely proportional, much to the genetic specialists’ surprise. The dwarfism diagnosis was not accurate, but the 1 out of ten physical characteristics for infants with Down syndrome was present. This set the wheels in motion for more blood work, and much needed answers. All I could think was here we go again! Our son was less then two hours old and already had several doctors scratching their heads and grasping for answers as to how he passed the prenatal screen tests. I was a wreck, hoping that this result was also negative, and became doubtful I would be able to raise a child with Down syndrome. Worries washed over me and seemed to taunt me every time I looked at him laying in that incubator. They seemed so huge at that moment, but seem so trivial now. Will he be happy and healthy? Would he ever drive? Would he ever get married? Will people see him as I see him – beautiful in every way and a gift no matter what his diagnosis. His eyes seemed to hold so much mystery as to who he would grow to be. Two days later the blood tests came back positive for Down syndrome. That moment is forever frozen in my mind. Even now I can close my eyes and be instantly brought back to that room where our lives changed forever and we became parents to a child with special needs. We grieved the loss of a typical child over the following days. It’s true you love your child no matter what, and it’s true you’ll go to battle for them for every reason. Every time I walked into the neonatal intensive care unit, he was there waiting and watching for my return. How comforting and calm he was when I was an absolute wreck. He quickly turned me into a warrior, an advocate, and funnily enough, became my mentor at just three days old. Dominic continues to amaze me daily especially when I see him take on new challenges and make them into opportunities. When he was younger, staying healthy was a challenge. Dominic has been hospitalized countless times for pneumonia and other infections, and he has had more surgeries than I can count, including having a device placed in his heart to fix a large atrial septal defect. Every time he comes out of the hospital he’s stronger and healthier and ready to tackle the next obstacle. When Dominic started school I was an absolute mess, but his new educational assistant welcomed him with open arms, a giant smile and an understanding about how I was feeling. At that moment I knew Dominic would do great, and this was the exact start that he needed and deserved. I often think about the “pioneers” who paved the way for individuals like my son. The countless hours, love and energy they spent advocating for inclusive classrooms, human rights, and the all around acceptance of people with Down syndrome. During Dominic’s first school year he met new friends and made solid friendships that he still has to this day. He also brought something to that classroom that no other child could have done: on countless occasions other parents have reached out to me to let me know that their children are learning sign language because of my son. Their children would never have had the opportunity to learn and use it on a daily bases if Dominic wasn’t in their class. I realized then those peers see the abilities in my son rather then his disability, an amazing feeling – better then I ever could have have imagined! Through all of Dominic’s life stages, I’ve found a great appreciation for our local Down syndrome association. Not only has Dominic made life-long friends, but so have we and I think of these other families as our second family. Daily advice is passed on between new and experienced parents on health, behaviour, education and whatever we are struggling with in our daily lives. I’m forever grateful to be living in such an amazing community that is full of acceptance, appreciation and most of all, respect. I’ll always believe that sometimes your greatest struggles in life can also lead to your greatest rewards.That is exactly how I feel about Dominic. He, along with my other two children, are my greatest rewards no matter what his diagnosis may be. I’ve learned countless valuable life lessons from Dominic in his short eight years: I’ve learned that when you set out to do something, you do it with total enthusiasm and with a smile on your face; when you hug, you hug with your whole body; when you fight for something, you fight with all you’ve got; and as you go through life, do not care what others might say or think, knowing those who love you will always be there till the end – all valuable lessons learned from my mentor Dominic. 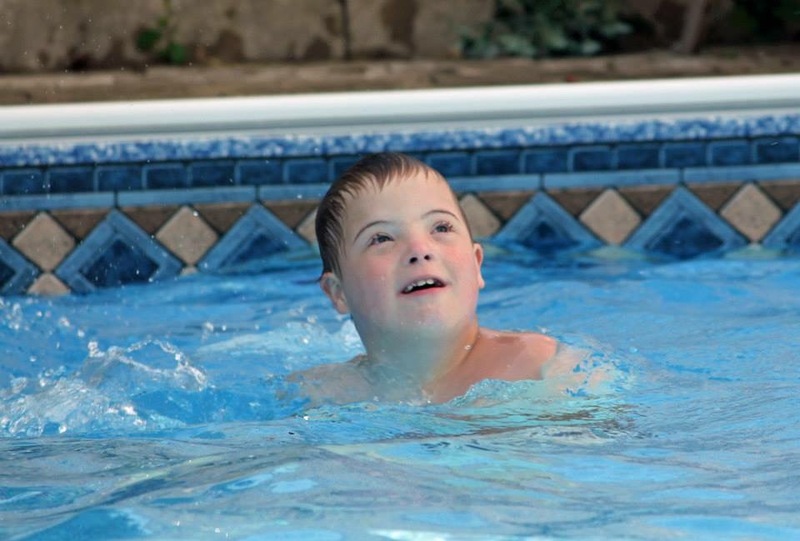 This week marks National Down Syndrome Awareness week, I celebrate my son and everything he brings to our family! A special thank you to Shannon for sharing her heartfelt parenting journey with HaltonParents. Dominic’s story is one of encouragement and inspiration for all parents. This entry was posted in Babies, Children & Tweens, Parenting and tagged Down syndrome, Grandparents, Mental Health, National Down Syndrome Awareness week, parenting a child with down syndrome, preschoolers, special needs, support for new parents. Bookmark the permalink.